BentoLunch.net - What's for lunch at our house: Finally Friday! It's been a very long feeling week in our house, so finally, it's Friday. We also had clean-out the fridge Thursday, so I'm kind of short on food right now. Thankfully, we had a chicken stirfry and I was able to steal some chicken out of it for Faith's lunch. She had chicken & cheese kebabs, goldfish crackers (the regular crackers did not fit in her box), teddy grahams and multi-colored fruit that I neatly chopped and separated by color. I'm not sure if my efforts were fully appreciated. 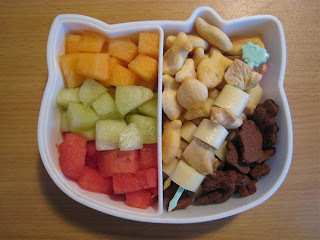 I'm so excited to find an updated and current bento blog for families with children! You have really great entries! Certain parties may not seem to appreciate the color-coded fruit on the surface, but I'd bet they really will. We out here in cyberspace really appreciate it too - inspiring!